Movie? Is it one of those season compilation things? Side story maybe? Just finished watching the movie for Space Brothers Zero... the in-between story... which was pretty good, if you liked the show... nothing great, but enjoyable... and at least it wasn't a compilation/summation project, but a fill in between the seasons of their youth and S1 when he got fired.... nice fill in actually. I'll have to look up this one... thought I heard something.... can't remember. Movie? Is it one of those season compilation things? Side story maybe? just saw in Wikipedia that its novel and manga ended in 2015, so S3 Is unlikely but there are 2 chances to fix the Tv finale... 2nd OVA then another film will be released later this year, hopefully not only side stories or recap again! Yeah, I see that... Hmmm.... guess it depends on the popularity of the series... et al... as it looks made for a continuation at least until the usual HS graduation ceremony... or something.... you could be right, wait until the S2 film compilation is out etc... but there's a S3 there... definitely. it looks made for a continuation at least until the usual HS graduation ceremony... or something.... you could be right, wait until the S2 film compilation is out etc... but there's a S3 there... definitely. I think this Liz and the Blue Bird is a couple of the other girls in the band, right? I forget the symoblism of the title.... it has a story... is a song or something. the regular story would have our female lead go into her senior year... with the band to nationals etc.... most likely to win. Ok, me no speak Nipponese... so no understand.... either the dialogue or the titles... which say what? Otherwise, yes, it's really rare for a story to follow teens from high school to the 'afterlife'. which makes me think of K-On.... I think the magma does take them to college... but nothing in anime form to follow... and that movie was rather weak... like some OVA thrown together (storywise) in a few moments... not well thought out... easy to fix though... utilize the classic dream sequence, in which more such movies could be made... taking their day dreams to other countries... see, I thought it out! And the same emotional stuff might happen in the 'afterlife', be it college, work etc... but it's more of the same... just a question of how much is needed before we learn our 'lessons'.... like Neo in the Matrix, to use a film example. Add in that most high school band members don't continue to take 'band' in college... at least I think that's the case, as in competitions, most of them learn they aren't that good and lose interest to varying degrees... and might never pick the instrument up again... especially as most instruments are made for collective/group performance... not like the more popular 'solo' instruments, like piano, violin, guitar etc... which can be used just for self-enjoyment... not many are gonna pull out their flute, oboe, trombone etc. just for 'fun', which is why those instruments get donated to the high schools etc. It would be interesting to see the next stage after high school, and into the 'after life'... it's rarely done if I remember correctly, sometimes an OVA. ah that was a digest special of S1 and 2, I just updated its latest trailer above... don't forget to enable CC, btw did you watch 2nd recap film new scenes? 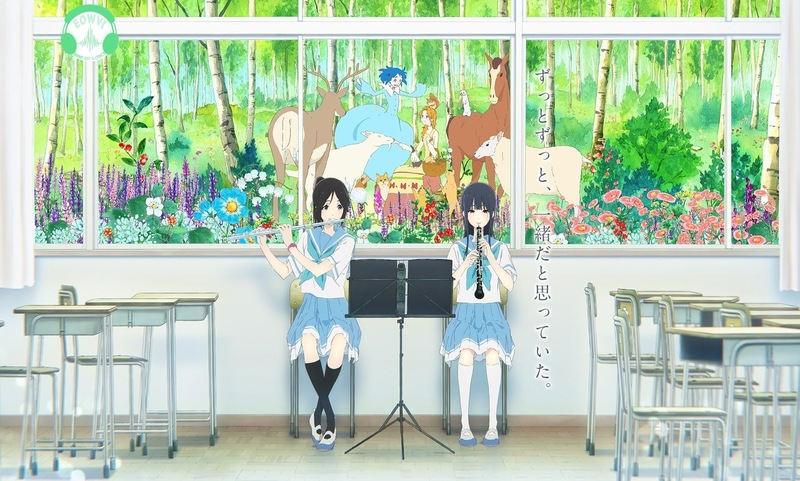 Haven't watched Liz and the Blue Bird yet, didn't realize it was out .... so, I'll check it out now, as I do like the series, story, characters, animation,etc. Nice to see good reviews, as the storyline could have legs and revisited. 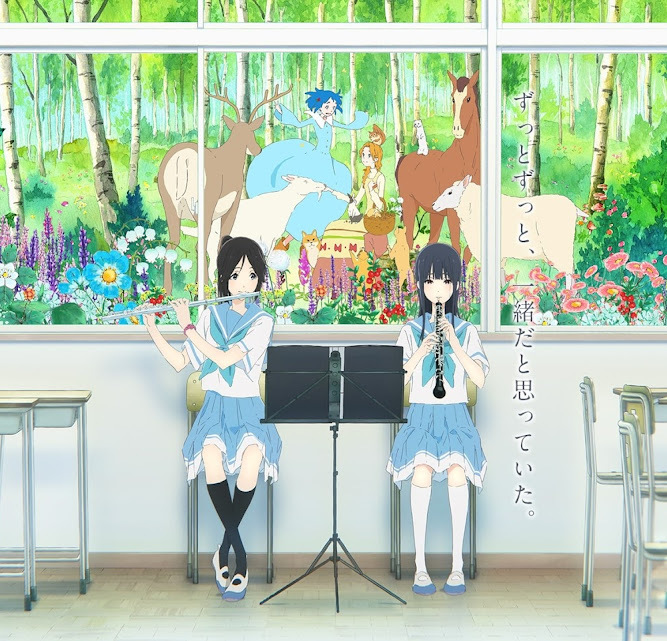 Just finished Liz and the Blue Bird, very nice.... artistic like the series, but in an opposing way.... which is symbolic of the instruments... not sure if that review mentioned it.... maybe it's because I was in band... but in the original series, the MCs are brass instruments... dramatic in a 'louder' sense, whereas in this film, the MCs are woodwind instruments... dramatic in a 'softer' sense.... and the storybook was nicely intertwined... interesting because at the end, the roles are more or less reversed in the sense that it's the quiet one that needs to leave the nest, not the louder one... etc. Also the role reversal in the use of the previous background characters as the leads in interesting... to see the former MCs now the background characters... makes me want to go back to the original to see the difference.... and they utilized the previous storyline of members who left band and later returned when the directer changed to the new guy. Definite A+ like the original I think.. softer, less brass and more woodwind... even the animation seemed so.... nice contrast, same with the music I think... the music the band played in this was woodwind based, not brass to complement the MCs.